Today: Sunny and warm. Afternoon breezes , high near 89°F . Predicted air quality is good, AQI: 49 (for Lake Elsinore courtesy of the SCAQMD). Tonight: Clear, low around 55°F. Thursday: Sunny and very warm. Afternoon breezes, high of about 90°F. Thursday night:Mostly clear, low near 55°F. Friday: Mostly sunny and warm. Afternoon breezes, high around 88°F. Friday night: Mostly clear, low of about 54°F. Saturday: Mostly sunny and warm. Afternoon breezes, high near 85°F. Saturday night: Mostly clear, low around 52°F. Sunday: Mostly sunny and warm. Afternoon breezes, high of about 82°F. Sunday night: Mostly clear, then low clouds and fog developing. Slight chance of showers after midnight, low near 51°F. Monday: Low clouds early, becoming partly sunny. Slight chance of showers. Afternoon breezes, high around 74°F. Monday night: Partly cloudy, then low clouds and patchy fog developing. Slight chance of showers in the evening, low of about 50°F. Tuesday: Low clouds and fog early, becoming mostly sunny. Afternoon breezes, high near 75°F. 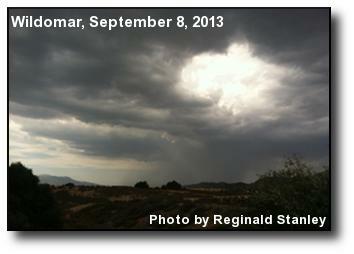 Wildomar forecast updated daily. Based on data from the National Weather Service, San Diego office and from WeatherCurrents. April 25 90°F 3°F N/A 0.00"
April 24 90°F 50°F N/A 0.00"
April 23 93°F 0°F N/A 0.00"
April 22 85°F 8°F N/A 0.00"
April 21 115°F 2°F N/A 0.00"
April 20 74°F 50°F N/A 0.00"
April 19 93°F 51°F 68°F 0.00"
Storm Cell: Clouds to the north dump rainfall on Lake Elsinore. Photo courtesy of Reginald Stanley.